MCCC President Dr. Jianping Wang and Georgian Court University President Dr. Joseph R. Marbach (center) shake hands following the signing of a new dual admissions agreement between the two institutions, while MCCC Vice President for Academic Affairs Dr. David Edwards (left) and GCU Provost Dr. William J. Behre (right) look on. 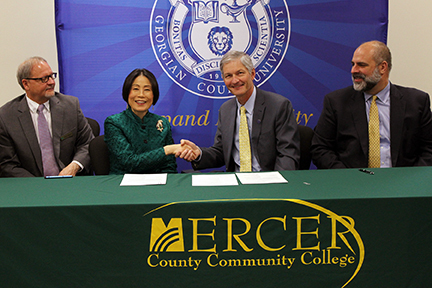 WEST WINDSOR – Mercer County Community College (MCCC) and Georgian Court University (GCU) today signed a formal dual admissions agreement allowing MCCC graduates to transfer to GCU with full junior status, and tuition discounts of up to 52 percent. The agreement covers all associate degree programs at Mercer, with special requirements for Education, Nursing, and Dance programs. MCCC students must complete 60 transferable credits with a grade of C or higher, and may transfer up to 75 credits. Students with a grade point average of 2.0 or higher qualify for tuition discounts at GCU ranging from 20 to 52 percent. Students will also have access to additional grants and scholarships available at GCU. Other student benefits of the dual admissions program include early planning with MCCC and GCU counselors to assure smooth transfer; participation in activities and use of facilities at both schools; and a guarantee that students who meet the requirements will have a reserved space at GCU. Established in 1966, Mercer County Community College is a publicly-supported, comprehensive educational institution that provides opportunities for higher education through an open-door admissions policy. With campuses in West Windsor and Trenton, N.J., MCCC offers more than 100 degree and certificate programs. It enrolls more than 11,000 full- and part-time students. Georgian Court University is a private institution founded in 1908 and is located on 156 picturesque acres in Lakewood, N.J. With more than 1,500 undergraduate and 600 graduate students, GCU offers more than 30 undergraduate majors and 11 graduate degree programs, in addition to a variety of certificate programs. For more information, visit www.mccc.edu or www.georgian.edu.